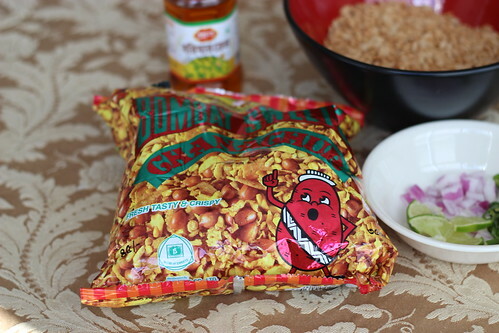 Jhal Muri with Crispy Brown Rice + Attune Foods Coupon Giveaway! There is a moving scene in the beginning of Jhumpa Lahiri’s novel The Namesake, where the protagonist’s mother, who has recently moved to the U.S. from India, is pregnant, homesick, and craving a taste from home. 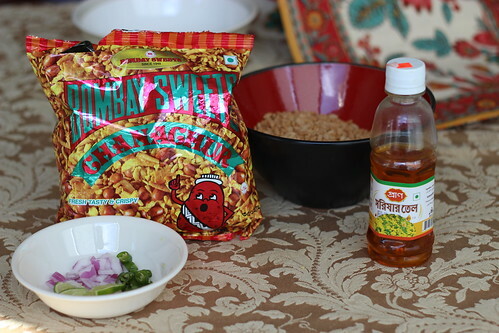 All alone in her apartment while her husband is at work, she rummages through the cupboards to come up with an improvised version of the popular Bengali snack, jhal muri, using Rice Krispies, peanuts, red onions, lemon juice, and green chilies. I am of course not even coming close to doing justice to the beautiful way in which Lahiri described this scene, but if you’ve read the book or have seen the movie, you should recognize the scene. And if you’ve never read the book or watched the movie, please do so! 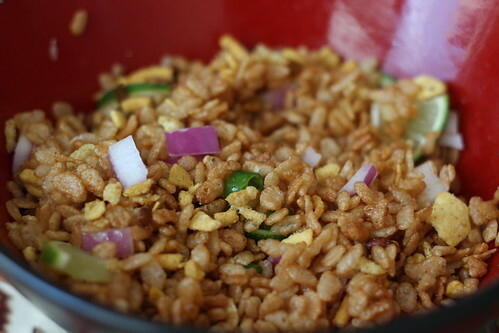 Jhal muri, which means “spicy puffed rice,” is traditionally a street food snack, but I’ve only ever eaten it at home, probably whenever my parents had a craving for it. Jhal muri contains muri, or puffed rice, and gets its “jhal“, or heat from mustard oil, onions, and green chilis. Other optional add-ins can include chanachur, which is a spiced snack mix, peanuts, boiled potatoes, fresh chopped tomatoes, cucumbers, and spices. This is another one of those versatile “non-recipes” like Aloo Bhorta where everything is customized to one’s taste. So what I might enjoy in my jhal muri may not be what someone else puts in theirs. All I know is the version I grew up eating contained muri, which we bought at the Indian stores, or Rice Krispies if we didn’t have any, mustard oil, chopped onions, green chilis, and usually some chanachur if we had some at home. I would sometimes add hot sauce to mine in lieu of the green chilis. And of course my dad would always have his own bowl which contained more mustard oil and green chilis than ours. Whenever jhal muri was made, you had to be sure you got to it fast, because it would disappear within minutes! I would say this was one of my favorite family treats and I always looked forward to it. Of course, when I make it now, I pretty much never have muri at home, so I improvise with Rice Krispies. And I’m pretty heavy-handed with the chanachur, just because I can be. I have been wondering lately if there is a way to make jhal muri a tiny bit healthier. Obviously, cutting down on the chanachur and mustard oil would be the first steps. And fine, not making a huge bowl of it and then devouring it all is the next step. Since I usually use Rice Krispies when I make jhal muri, I thought about using a brown rice version instead. So when Attune Foods offered to send me some of their Erewhone Organic cereal line to play around with, I immediately knew what I was going to do with the Crispy Brown Rice cereal. *Disclosure: Attune Foods sent me samples of Erewhon Organic cereals to try. I did not receive any compensation and am not obligated to post a positive review. Any opinions are my own. 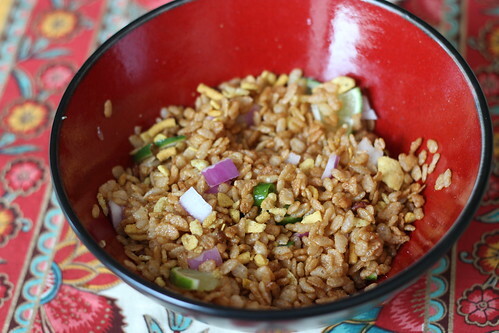 I added a couple spoonfuls of pungent mustard oil to some of the Crispy Brown Rice cereal, chopped up some red onion and green chilies and added those to the bowl, then added some chanachur to taste. Then everything got tossed together until the flavors melded. Finally, some sliced limes to squeeze over the mix! I took a taste and all the familiar flavors were there: the sinus-clearing mustard oil, the sharp crunch from the red onions, the heat from the green chilis, the spicy saltiness from the chanachur, the tang from the lime juice, and finally, the mild almost malty sweetness from the Crispy Brown Rice cereal in the back, tying it all in. This was the taste that transported me back years ago to my family’s kitchen and I’m sure this is the taste that gave Ashima Ganguli her taste of home half a world away. Despite my attempts to lighten up this treat, Mr. Spice and I made quick work of the jhal muri and he’s already requested that I make this more frequently. I got a chance to play around with a couple different cereals from Attune Foods’ Erewhon Organic cereal line, and now you can too! 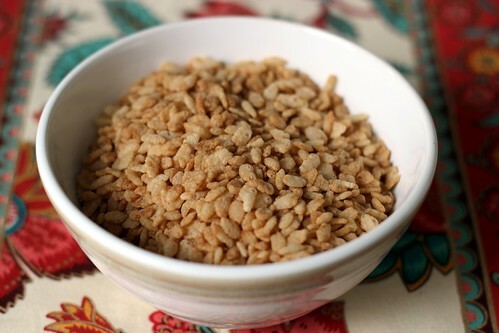 The folks at Attune Foods have generously offered to give one lucky Spice’s Bites reader 3 coupons for their Erewhon Organic cereal! There’s something for everybody — gluten-free/non-gluten free options, natural flavors, and all of the cereals are dairy/soy/nut free as well, so this is the perfect opportunity to give them a try! 1. Leave a comment telling me which cereal you’d like to try. 3. “Like” Spice’s Bites on Facebook and leave me a comment here for an additional entry. That’s it! The giveaway will run through Friday, August 3rd at 9pm Eastern time. You must be a US resident and over 18. When leaving a comment, make sure you enter your email address (it won’t show up in the comments) so that I can contact you. I love their cereals. I haven’t tried their crispy brown rice cereal yet; so, that would be the one I would want to try. And also to make your recipe above. Yum! I’ve liked Attune Foods on Facebook. I’ve liked Spice’s Bites on Facebook. I’d like to try their Uncle Sam’s cereal! And I liked Spice Bites on FB too! I really liked Interpreter of Maladies, but hadn’t heard of The Namesake. I like Attune foods on facebook it is AWSOME!